Make teatime a Ghibli moment by enjoying a piping hot cup with Studio Ghibli’s most loveable creature! This Totoro inspired glass tea infuser set also comes with a bonus heat resistance, leaf-shaped silicon coaster! Phone running out of juice form playing Pokemon Go all day? 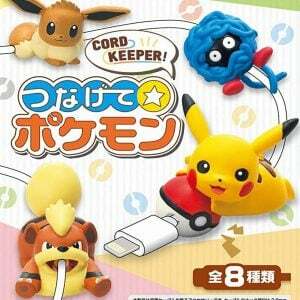 What better way to charge your accesories than with these cute Pokemon cord keepers that’ll protect your cable from damage. Available in 8 of your favorite Pocket Monsters! Fight smoke alarms by moonlight and win people’s stomachs by daylight. Become a hero or princess of the kitchen with these cosplay aprons and conjure up a meal in style for someone special while looking absolutely adorable. Upgrade your dull MacBook to a new level of cuteness and become the envy of every Studio Ghibli fan! This set of Totoro keyboard stickers will inject some fun into your notebook to create a unique and eye catching look. If you haven’t already mastered the art of Shunpo, these straw sandals may just help you move as swiftly as a Shinigami! These hand-woven sandals are often the trickiest part of perfecting a Bleach cosplay. Thankfully now it’s just a click away! If you’re someone who likes to make a statement that no one will ever forget, these tentacle earrings are for you! The octopus-inspired accessories come as a pair of either real or fake gauge earrings with an array of crazy and beautiful colors to choose from. Dress up your home bathroom or kitchen with this highly geeky, yet attractive mat. Features a soft and fluffy surface decorated in the likeness of everybody’s favorite neighbor, Totoro! Matching bath and hand towels also available! Hangout with your favorite ninja while you have your morning pick me up! Once this heat changing mug is filled up with a hot beverage, Naruto will multiply by performing his shadow clone technique. A must have for any Naruto fan! Titans have broken through Wall Maria and are heading for the supply depot in Trost. It’s up to you and your team to fend off the Titans before they can succeed. Play as your favorite Survey Corps member… or as the Titan! The iconic maneki-neko or “lucky cat” is believed to bring good fortune to the owner. Now you can pass the luck on to your favorite small plant or succulent with this lucky cat planter. This chubby kitty is the perfect addition to your bookshelf or desk. Upgrade your wardrobe by placing your fashion sense safely into the hands of these forest spirits! These glow in the dark Kodamas from Princess Mononoke come printed on high quality t-shirts for both men and women! Master the art of leaving stain free surfaces! Show off your love for the Avatar series and ring free tables with this set of custom drinking coasters. Each coaster features one of the four elements in an Mayan art-style painting. Stay warm while looking like everybody’s favorite ninja with this Naruto styled hat! Supremely crafted from high quality yarn, this original Naruto knitted hat makes an excellent gift idea for a special Narutard in your life. Give fair warning to friends, family and strangers that you may spontaneously start talking about anime! This hilarious t-shirt is a must have for anime fans who can’t speak two words without bringing up what their favorite characters are doing. Turn heads in the street and bring back painful Fullmetal Alchemist memories with this absolutely savage t-shirt! People won’t even be able to look at you without being sad. Good thing the fusion only lasts 30 minutes… Right? Geek up any home or office by leaving a message any Pokemon Trainer would understand. Capable of fitting over most door knobs, these cross stitched door hangers feature a sleepy Pokemon as a reminder you wish to remain undisturbed. You may not be living in the forests among the wolves, but you’re still going to want to bundle up this winter! This furry vest features a design inspired by San from the classic Princess Mononoke. Perfect for riding wolves or just heading out for the night. This Naruto headpiece costume is for the ultimate Naruto bunny parent fan! It is perfect for photo shoots, special occasions, cosplaying, and Halloween. This costume comes with the headband and an embroidered shuriken.